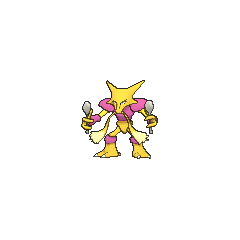 Alakazam in game: 1,048 Who? Important notice! Pokemon Alakazam is a fictional character of humans. Alakazam is characterized by its humanoid structure and large mustache. The female Alakazam has a significantly shorter mustache than the male. Its snout is long and thin, and it has long, ear-like spikes extending from the back of its head. Additional spike protrude from each cheek. Covering its yellow, skeletal body are brown armor-like sections over its chest, shoulders, forearms and knees. There are three toes on each foot, each of which has a white claw. It wields a silver spoon in each hand, which act as amplifiers for its psychic abilities. 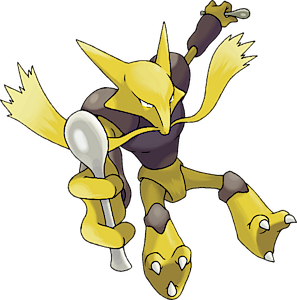 Alakazam is able to lower the accuracy of its opponents by bending the spoons it wields, using its signature move Kinesis. As Mega Alakazam, this Pokémon gains a large white beard and its mustache becomes larger and white. The armor-like sections become bulkier, and its upper body section becoming slightly shorter to reveal its thin stomach. The head becomes diamond-shaped, but it keeps its four spikes. Additionally, it gains a large, oval, red organ in the center of its forehead. The organ is said to emit psychic power. Its lower legs become longer and slimmer and its feet become skinnier and resemble talons. It gains three additional spoons, which it levitates in the air. 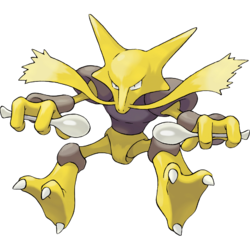 Alakazam is able to use all forms of psychic abilities. These powers are used to move its body, as opposed to its weak muscles. It also uses its psychic powers to hold up its head, which is too heavy to be supported by its neck, due to its continually growing brain. It is said to have an excellent memory and can remember everything that it has experienced since hatching as an Abra, and has an IQ that exceeds 5,000. It is found in urban areas. Alakazam also made an appearance in Pokémon Double Trouble. 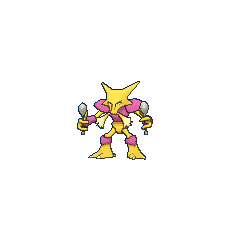 This Alakazam was used by Luana, the Gym Leader of Kumquat Island, in a Double Battle against Ash. Gary Oak was seen battling Alex Davis's Alakazam with his new Umbreon in Power Play!. Alakazam appeared under the ownership of Eusine in For Ho-Oh the Bells Toll and The Legend of Thunder!. Anabel owns an Alakazam that appeared in Talking a Good Game and Second Time's the Charm. 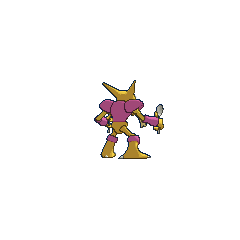 A Trainer's Alakazam that can Mega Evolve into Mega Alakazam appeared in Mega Evolution Special IV. An Alakazam that can Mega Evolve appeared in Volcanion and the Mechanical Marvel, under the control of Levi and Cherie's Mega Wave. An Alakazam appeared in Mewtwo Strikes Back as one of the Pokémon Mewtwo defeated while serving for Giovanni. An Alakazam belonging to Rudy made a cameo appearance in Misty Meets Her Match. 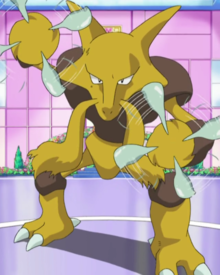 An Alakazam appeared in the second Pokémon movie, The Power of One. A Trainer's Alakazam appeared in Flower Power participating in the Pokémon Exhibition. 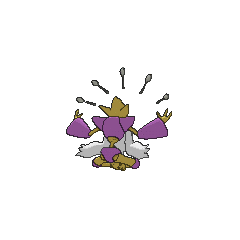 An Alakazam was one of the Pokémon living in Len Town in The Psychic Sidekicks!. Gary himself has an Alakazam that he may or may not have caught as an Abra or a Kadabra. 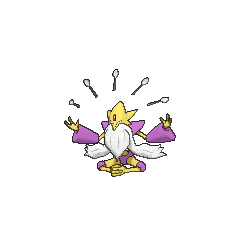 This Alakazam was seen in Gary's profile in The Ties that Bind!. An Alakazam belonging to a Coordinator was used during the Hoenn Grand Festival in Deceit and Assist. A Coordinator's Alakazam appeared in A Hurdle for Squirtle competing in the Saffron City Pokémon Contest. An Alakazam also appeared in One Big Happiny Family! in Jessie's fantasy. An Alakazam also made an appearance in Historical Mystery Tour! under the ownership of a Clown. An Alakazam that can Mega Evolve into Mega Alakazam appeared in Mega Evolution Special I. 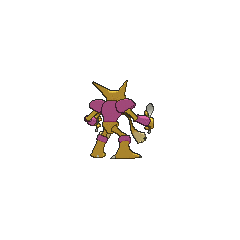 Blue owns an Alakazam, which appeared in The Challenger. He used it during his Pokémon League battle against Lorelei and her Lapras, where it eventually won, letting him progress to battle Bruno. Alakazam debuts in Buzz Off, Electabuzz! when Red frees the Pokémon kidnapped by Lt. Surge; instead of his beloved Abra, the President of the Pokémon Fan Club finds himself with an Alakazam. Sabrina is also seen in possession of an Alakazam in Karate Machop!, which she uses to hand out the eight Spoons of Destiny (Red also received one prior to appearing at Cerise Island from Giovanni). Otherwise, it is not seen as much in battle as its pre-evolved form. Later in the Black 2 & White 2 chapter Sabrina has her Alakazam use its abilities to pick out a Brycen-Man movie for Whitley. In Rock, Paper...Scizor, Blue captures a wild Alakazam after it was rampaging near Viridian City. After he had become the Gym Leader of Viridian City he uses it to challenge opponents at his Gym when he's not there. An Alakazam was seen in a Poké Ball at Oak's Laboratory in Cherrygrove in Off Course with Corsola. In The Last Battle XIII an Alakazam was one of the Pokémon sent to help the fight in Ilex Forest. 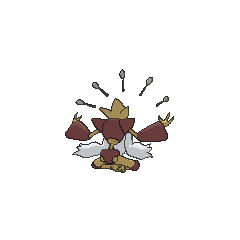 An Alakazam was used by Emerald in his Pyramid and Dome challenge. Mira has an Alakazam which was used against Cheryl and her Blissey in Leaping Past Lopunny. The spoons clutched in its hands are said to have been grown by its psychic powers. Erases rocks and blocks (max 10), and also does damage to the foe. Alakazam could be seen as a counterpart to Machamp. They are both the last stage of a three-part evolutionary family, they reach their final stage by trading, and they both have a 75% male gender ratio. Also, Alakazam excels at the Special Attack stat, while Machamp excels at Attack. They are both in all regional Pokédexes (excluding the Unova dex). Their evolutionary families are also next to each other in the National Pokédex. Moreover, a girl in Oreburgh City will trade her Abra for a Machop.